Will you issue a collective shrug, or will the world’s largest multilateral lender choose to send a strong message that government-backed financing for the fossil fuel industry is no longer acceptable in a world facing a climate crisis? Will you commit to making the EIB the EU’s financial vehicle for a rapid energy transition that will save lives, create jobs, and help ensure the EU does its part to meet the goals outlined in the Paris Agreement? We ask you to ensure that the new EIB energy lending criteria exclude financing of fossil fuels. Among the eight scenarios laid out by the European Commission to achieve net-zero emissions by 2050, none allow for further expansion of the fossil fuel industry, least of all with public money. The world’s preeminent scientists have recognized the need for a rapid energy transition away from fossil fuels, and have highlighted the massive risks of exceeding 1.5°C of warming. Thousands of students across the EU — and many more around the globe – have mobilized in the streets. And the smart money is already fleeing the fossil fuel industry. All of the signs point in one direction: Climate leadership is incompatible with continued financial support for the fossil fuel industry. As you know, if the world is to meet the climate crisis with adequate ambition, then it’s imperative that the EU demonstrate leadership on climate action. The EIB has tremendous power to signal to the wider financial world that the era of government support for fossil fuels is ending. In this moment, we desperately need your leadership. The science is clear: we need to stop expanding the fossil fuel industry, and we need to do it now. This means we can’t waste one cent more of government-backed finance on the fossil fuel industry. Luckily, we have a chance to take a big step toward that goal: in the next few weeks, we have a chance to get the European Investment Bank — the EU’s biggest government-backed bank – to stop funding fossils. The EIB is seeking public input on what their future energy finance should look like. If you think (like we do) that they should stop funding fossils and double down on the clean energy transition, then this is your chance to let them hear it. International pressure could make the difference between a good decision and a bad one. As the world’s largest multilateral lender, it’s crucial that the EIB take a leadership role. If they move on this issue, you can be sure that many other financial institutions will follow. 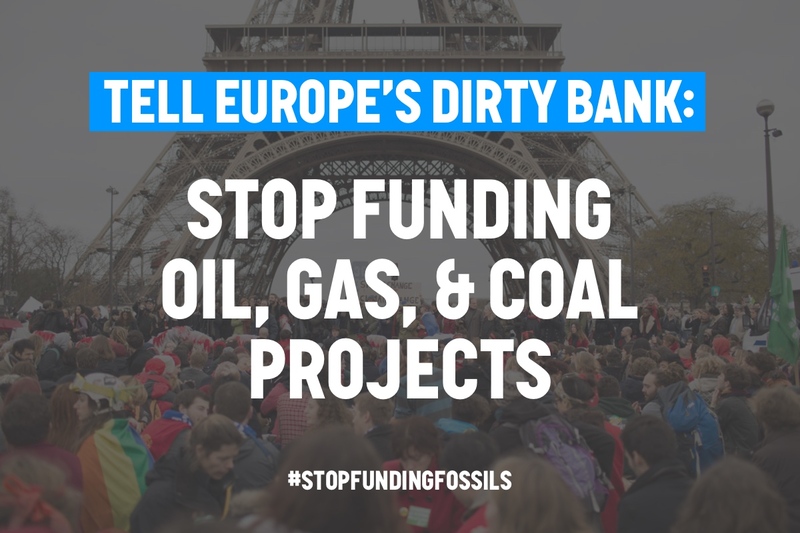 Tell EIB leadership to grab this opportunity to be true leaders — tell them to #StopFundingFossils. The world needs a fossil free EIB.